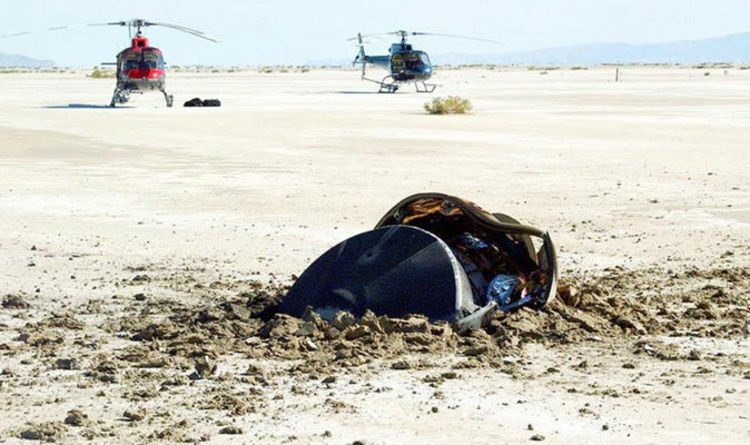 Alien hunters were sent into a frenzy when images were released by NASA which showed a crumpled, metal object in the ground with helicopters hovering nearby. However, it is not the beginning of an alien invasion but an experiment from NASA which went wrong. Three years prior to the 2004 image, NASA launched Genesis – a mission which was designed to monitor the sun. The first instalment of the mission was a success with Genesis collecting valuable data on the sun, solar particles and Earth’s magnetic field. However, the final part did not go to plan. NASA had hoped the spacecraft would be reusable and when it returned to Earth, two sets of parachutes were meant to deploy. They obviously both failed, allowing Genesis to crash into the Utah desert at 300 kilometres per hour. NASA said alongside the photo: “The unexpectedly hard landing at over 300 kilometres per hour occurred because the parachutes did not open as planned. “The Genesis mission had been orbiting the Sun collecting solar wind particles that are usually deflected away by Earth's magnetic field. “Despite the crash landing, many return samples remained in good enough condition to analyse. So far, Genesis-related discoveries include new details about the composition of the Sun and how the abundance of some types of elements differ across the Solar System.